The key here is balance: balance between the sugar, alcohol, acidity and flavors. 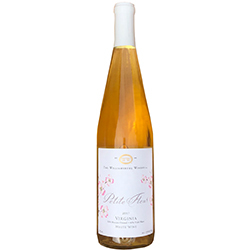 With the 2017 Petite Fleur, I believe we have achieved that balance and in so doing have created a wine that offers apricot, peach, pear, melon along with a touch of tropical fruits. These meld nicely with notes of wildflowers and a creamy vanilla finish. The wine is not viscous but rather clean and bright yet with a full round mouth feel with the flavors lingering for a long time. For food pairings, think foie gras, stilton cheese or an apricot torte! The Muscat Ottonel was harvested at night on 8 September 2017 at 22.5 brix, 3.51 pH and .670g/L TA. The Vidal blanc was harvested on 27 August 2017 and then frozen in the picking lugs. After pressing the brix was 32. Website experience designed and maintained by GlassickUX.